Freshman Autumn Fluetsch scored the first goal of the game at the 20-minute mark of Monday’s 5-1 Cutthroat girls’ soccer win over the Bliss Bears. Back in a big way from fall campout trips, Community School girls’ and boys’ varsity soccer teams nailed down important home High Desert Soccer Conference victories over Bliss on Monday at the Sagewillow Farms soccer fields. Coach Kelly Feldman’s Cutthroat girls (11-2-1, 10-0-1 league) clinched the top seed in the upcoming seven-team HDSC tournament with a 5-1 victory over Bliss in what was a close, one-goal contest with just 16 minutes left in the game. And coach Richard Whitelaw’s Cutthroat boys (8-5-1, 6-4-1) amassed an 8-1 win over the visiting Bears and thus clinched the fourth seed in the HDSC league tournament. In both cases, the Cutthroat teams welcomed back players who had been sidelined by injuries. And in both cases the Sun Valley teams showed little rust from a 10-day break from soccer competition. Just one game remains. Today, Wednesday, the Cutthroats play host to Wendell. The boys’ junior varsity scrimmage begins at 4 p.m. followed by the boys’ varsity at 5 p.m. The girls’ varsity game against Wendell is scheduled at 4:30 p.m. Middle school home soccer games with Bliss will be today, Wednesday at 3 p.m. (girls) and 4:15 p.m. (boys). After today, the No. 4 Cutthroat boys play next on Saturday, Oct. 6 at 4 p.m. at SunWay Soccer Complex in Twin Falls against the No. 5 Bliss squad. The Cutthroat girls, having earned a first-round bye, wait until Monday, Oct. 8 to host a second-round game at 4:30 p.m. on their home Elkhorn pitch. Now unbeaten in their last 10 games, the Cutthroat girls out-shot Bliss 27-11 Monday with an 8-2 advantage in corner kicks—but it wasn’t until late in the second half that they were able to blow it open. That was chiefly because of Bliss goalkeeper Lupita Villavicencio (18 saves) and the solid Bears defense. Yet Cutthroat senior keeper Ella Marks (11 saves) also had an outstanding effort and made the biggest save of the game. With Bliss gaining momentum on Anna Orr’s goal one minute after intermission that sliced the Cutthroat 2-0 halftime lead to 2-1, Marks made a great stop on striker Estefany Altamirano’s blast at 63 minutes and preserved the lead. In the next two minutes the Cutthroats scored twice—Hannah Dies (15 goals) intercepting a clearing kick and drilling a shot into the corner, and Dies picking off another goal kick and passing to Katie Feldman, who one-timed a 25-yarder for a 4-1 bulge at 65 minutes. Josie Allison finished the scoring with a minute left. In the first half, Autumn Fluetsch opened the scoring at 20 minutes and Feldman tallied her first goal on another Dies feed at 36 minutes. Other assists: Lilly Jenner and Hannah Conn.
Bliss (7-2-2 league) earned the second seed in the tournament and may travel to Elkhorn again Wednesday, Oct. 10 for the tournament title game. Last year in the HDSC tournament, the No. 2-seeded Cutthroats beat Bliss 4-1 in the championship bracket semi-finals and won the tournament title for the third straight year 5-2 over Buhl. Bliss went on to capture the league’s second berth to the state tournament 2-0 over top-seeded Buhl. Feldman’s squad is seeking the school’s 12th straight trip to the state soccer tournament. 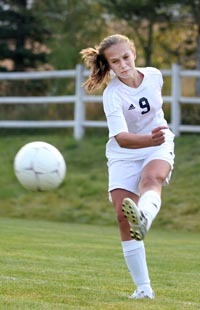 The Cutthroats have brought home state trophies the last three years—consolation honors in 2009 and 2010, and the third-place hardware last October. Over two seasons the Cutthroat girls (24-7-2) have outscored opponents 169-36 and boast 17 shutouts in 33 games. The tournament qualifies two teams for the State 3A meet Oct. 18-20 in Twin Falls. Community School senior Cameron Jenner recorded the first three-goal hat trick for a Cutthroat player since 2008 on Monday in the lopsided 8-1 victory over No. 5 Bliss (4-6-1). Whitelaw’s “Man of the Match” Jenner (8 goals season) led the scoring parade that also featured singles by Roger Figge, Tom Gillespie, Ben Kanellitsas, Bobby Corker and Jay Fitzgerald, playing his first game since August after being injured with a concussion. Tanner Flanigan’s three goals in a 5-1 home win over Filer Aug. 25, 2008 was the last Sun Valley hat trick, followed by 80 games until Jenner’s. Looking ahead to the tournament, the Cutthroat boys are likely to have a tougher time qualifying for state for a second straight year. They do need to win their first game in a tournament format that eliminates the three losing teams on the first day of play Saturday. If they beat Bliss Saturday, the Cutthroats are likely to face the league’s top side, Gooding (8-1-2), on Monday, Oct. 8 at 4:30 p.m. on the Gooding field. Gooding beat the host Cutthroats 4-1 Sept. 19. The teams tied 2-2 at Gooding Aug. 27. Last year, Filer captured its first-ever HDSC tournament title 4-3 over Gooding. Gooding then defeated the Community School 1-0 for second place in the league, but Whitelaw’s Cutthroats made state as the third-place team in the seven-team conference and then won the state consolation title. This year, the HDSC gets only two state berths for both the girls and boys. The HDSC championship game is set for Wednesday, Oct. 10 with the second-place game scheduled for Friday, Oct. 12.